Do you know how to use the sketch chamfer tool in SolidWorks? The Sketch chamfer tool is mainly used to convert a vertex or intersection of two lines into small equal or unequal or varying angle distant line. It replaces the vertex by a line having a length. You can also control the angle of the line from the reference line. Here I’m going show the usage of the Sketch chamfer tool in SolidWorks Sketch area. Note: This is just tutorial showing how to use sketch chamfer tool, not showing any product drawing or designing in it. If you are advanced SolidWorks user please avoid it. This Solidworks tutorial is for beginners, students or people likes to learn about SolidWorks. Open the Solidworks and New part File. 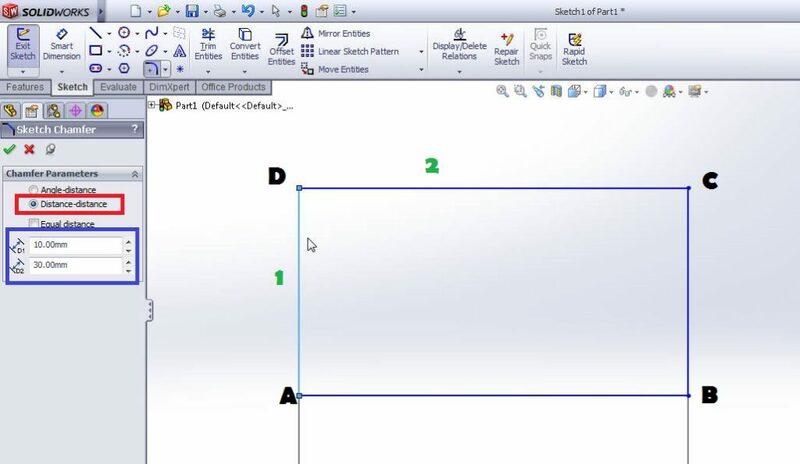 If you don’t know it, read How to Create New Part File. Select the Plane (e.g. Top Plane) and normalize using the “Normal To” Button. Read Heads-up toolbar on this blog. For the understanding of this tutorial I simply make Rectangle “ABCD” of dimension 100 in length and 60 in width (100 x 60 mm). You need to apply chamfer tool on vertex C and D.
From the command manager, you select the “Sketch Chamfer” button by clicking the mouse pointer on it. From Solidworks Menubar, click on the “Tools” menu and drop down menu will appear, from that select the “Sketch Tools” and a side menu will appear. From that select “Sketch Chamfer” option. Here you can do 2-types of Chamfering. For the sake of showing this tutorial, I roughly select the vertex “C” for angle-distance chamfering. From the Chamfer property manager, select “Angle-Distance” which marked in red box and click on the Line 1 (marked as green) as shown in the above image. Then enter the Angle and distance values as per your requirement or drawing. Here I’m entered “30 mm distance” and “35 degree angle” value. Then click on the “Line 2” marked with green 2 numbers in the above image. Then you get a complete angle-distance chamfered sketch drawing. For this tutorial, select the vertex “D” and you need to chamfer or insert unequal distant line form the corner D.
From the chamfer property manager, select the “Distance-Distance” option marked with a red box. Then select The Line 1 represented with green color as shown in the above image. Enter the values of Distance-1 (D1) and Distance-2 (D2) in the blue box. Here I enter D1= 10 mm (vertical) and D2=30 mm (horizontal). Click on the adjacent line (Line 2) and then click “OK” (green tick button) on the property manager. If you need to change the D1 and D2 values, just click “Undo” and make necessary changes and click OK. Here you enter the chamfer parameters like angle, distance etc. Let see them one by one. Angle-Distance: Here you can enter the chamfer angle and distance like the above tutorial. Distance-Distance: Here enter the two chamfer distances by selecting this option. If you click on the “Equal Distance” option, you can insert an equal length line in the corner. Thank you for reading this SolidWorks Tutorials and feel free to share your honest opinions about it.